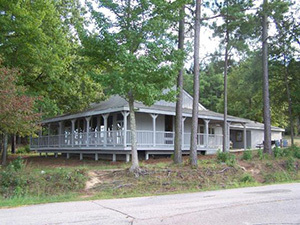 Located next to the boat ramp in the Rolling View recreation area, the Community Building has a large meeting room, kitchen facilities, restrooms and a gas fireplace. It accommodates 70 people with chairs and tables, or 120 people with chairs only. It is near a boat ramp, beach, and hiking trails. The building may be occupied between 9 a.m. and a half hour before park closing. Note: Pig cookers must be kept on grass. Reservable shelters are available at Sandling Beach, Rolling View and Beaverdam. All the shelters are handicap accessible and have access to drinking water and restrooms.